4WD rental from Campabout Oz is the perfect way to experience the magnificent Bungle Bungles in Western Australia. Our four-wheel-drives allow you to drive right in. You’ll gain access to areas other vehicles can’t get to, including serene outback camping areas. 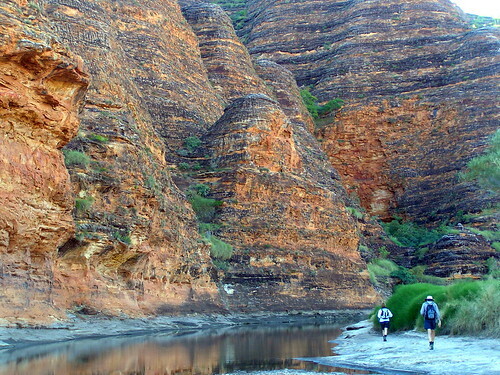 The Bungle Bungles is a stunning natural phenomenon of beehive-like limestone formations. Their unusual tiger stripe colouring comes from algae that grows and within the pores of the honeycombed rock. Their beautiful red/orange color results from a combination of manganese and iron that stains the rock. The Bungle Bungles was originally home to Western Australia’s Aboriginal people, who lived their during the wet season. Being home to a wide selection of wild life and plant life, the area provided the perfect place to live. Until the mid 1980’s, the area was relatively unknown to white man. This changed, however, when in 1987 it was named a national park. Much later, in 2003, the are gained worldwide recognition when it was inscribed into the World Heritage List. Whether you’re a tourist from overseas, or an Aussie who has never truly experienced the outback, you’ll get an amazing holiday experience with 4WD rental in the Bungle Bungles. Make a point of seeing these impressive rock formations at least once in your lifetime. Read our customer reviews and you’ll discover it’s a place worth seeing… so book your 4wd rental today.